The Mercedes-Benz W114/115 chassis is the often overlooked E-class predecessor chassis that is overshadowed by the prettier W108/109 chassis. The big S-Class ancestor W108 with its fancier front end and stacked headlamps is a bargain classic, so the downmarket W114 is forced into an even more compromised market situation...bad news for "collectors" but great news for folks who want to run/drive cheap classics. Find this 1971 Mercedes 250C here on eBay bidding for $4,000 with 4 days to go, located in Virginia Beach, VA. Tip from Don. 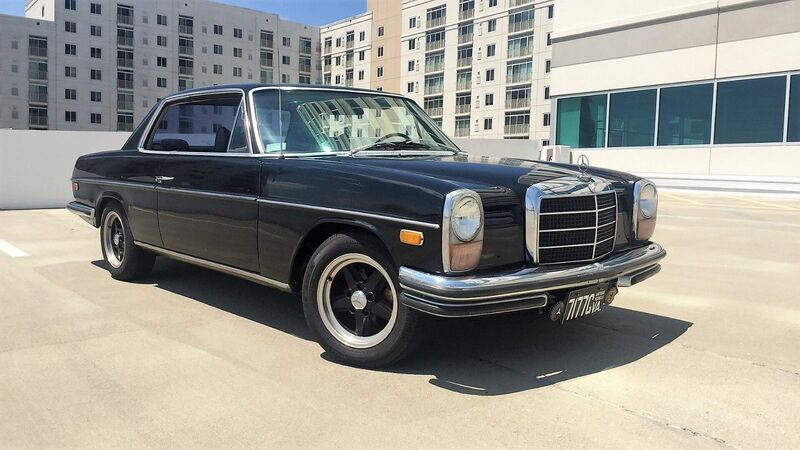 The time has come for me to sell my 1971 Mercedes W114 250C Stroke 8. The very popular W114 model line of "executive cars" was styled by Paul Bracq as luxurious every day vehicles. The W114 & W115 models began in 1968 and were marketed as "new generation models" giving their id plates the "/8" earning them the slash eight nickname (or in German strich acht). They were the first post-war Mercedes-Benz production cars to use a newly engineered chassis rather than one derived from previous models. The 250C and the 280C are considered by Mercedes enthusiasts to be one of the best classics from the 60's and 70's era. The US versions of this car received a larger 2.8 liter M130 Straight Six engine instead of the 2.5 liter used in European cars. 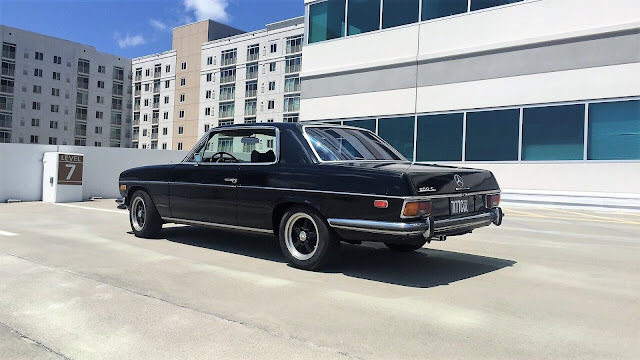 This 250C is in great driver condition with classic pillar less coupe good looks and a reliable driveline similar to what was in the much more expensive Pagoda SL-Class models. The iconic "batman" headrests and magnetic Kangol 3-point seatbelts really make the interior a great place to be. The finicky factory carbs have been replaced with the well regarded Weber Conversion. Being a southern car, this Mercedes is a survivor that was cared for. This car has the original M130 engine (2.8L inline six cylinder) that keeps up with modern traffic. The alternator and power steering pump have recently been rebuilt and the tires were replaced last year. The A/C was gone through and charged up but the charge only held for a day due to what was traced to be a leak in an A/C line. Due to faded original paint, the car was repainted in its original black single stage color last year. The paint looks good for a driver but would look even better after a wet sanding. Unfortunately, when the shop removed the fog lights, they misplaced the mounting brackets so the original Hella fog lights come with the car but are not installed at this point. Besides the Weber conversion, there is something else that sets this car apart from a normal 250C and that is its set of 15" Ronal Penta AMG style wheels that are painted to match the body color. There is even a fifth Ronal wheel in the trunk as a spare tire. This car is a head turner with classic Mercedes pillar-less coupe style and a great driver that is very inexpensive to insure and looks great when you roll into Cars and Coffee. Hagerty Valuation for a car in this condition is $7,800 (not including Weber conversion or wheels), but I am letting this go with no reserve to the high bidder. If you would like to pay for a Pre-Purchase Inspection before bidding, please let me know as I can take the car to the local shop of your choice. I would feel comfortable driving it across the country so if you wanted to fly into Norfolk International Airport and drive it home, I would be happy to pick you up. If you would prefer to have the car shipped, I would be happy to help your shipping company get the car loaded. Really like these, but the schwarz is not doing it for me. The paint is pretty sketchy looking. This is really lovely. I had a '68 230 sedan with the factory dual Zenith/Stromburg carbs and they were constantly going out of balance (may have been operator error, I was new to wrenching). It was mostly an annoyance at low speeds but when the car got up to speed it was terrific. 55mph was a drag, but 75-80mph the engine was on song and the car came alive. I'd love to know how it runs with the Weber conversion. Great cars. I always found it to be plenty of power around town and it really liked 80mph on the highway, which was a happy coincidence, because so do I! I love verts. And old Benzes. Could never afford a classic MBZ vert. Hey, and let's be honest: Unless I inherited a MBZ scrapyard, I couldn't afford to maintain one, neither. But I always had that dream... of buying a well-cared for coupe, and having a professional shop turn it into a 'vert. Sure, it wouldn't be worth as much, since I'd hacked up a perfectly nice coupe'. But I wouldn't do this for resale value. I really like these cars but the black with black wheels isn't my cup of tea. Pretty much any color looks better. The painted over rusty panels isn't helping to convince me either.